Volcanic landforms and volcanic landscapes are aesthetically and geologically fascinating. They result from some of the most powerful constructive and destructive processes on Earth and on other terrestrial planets. Precious records on eruptive activity and potential volcanic hazards, as well as valuable information on inaccessible endogenic processes of terrestrial planets can be revealed through studies of these constructs. Iceland is exposed to rapid and dynamic landscape changes caused by natural processes and man-made activities, which impact and challenge the socio-economic situation of the country. The wealth of the RS data provides an opportunity for detailed analysis and information extraction. However, currently there is lack of operational advanced information processing techniques, which are needed for end-users to incorporate data from multiple data sources, but the data can be on the scale of terabytes. Hence, the full potential of the recent RS data explosion is not being fully exploited. In the EMMIRS project will bring Iceland into the international forefront by bridging this gap between advanced information processing capabilities and the end-user mapping of the Icelandic environment. 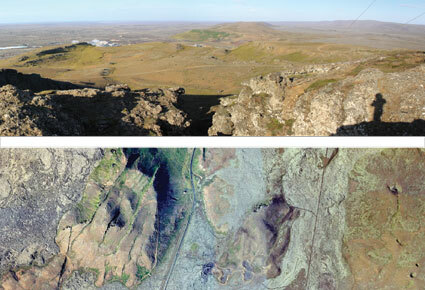 This is done by a multidisciplinary assessment of two selected remote sensing super sites, Hekla and Öræfajökull, which encompass many of the rapid natural and man-made landscape changes Iceland is exposed to. 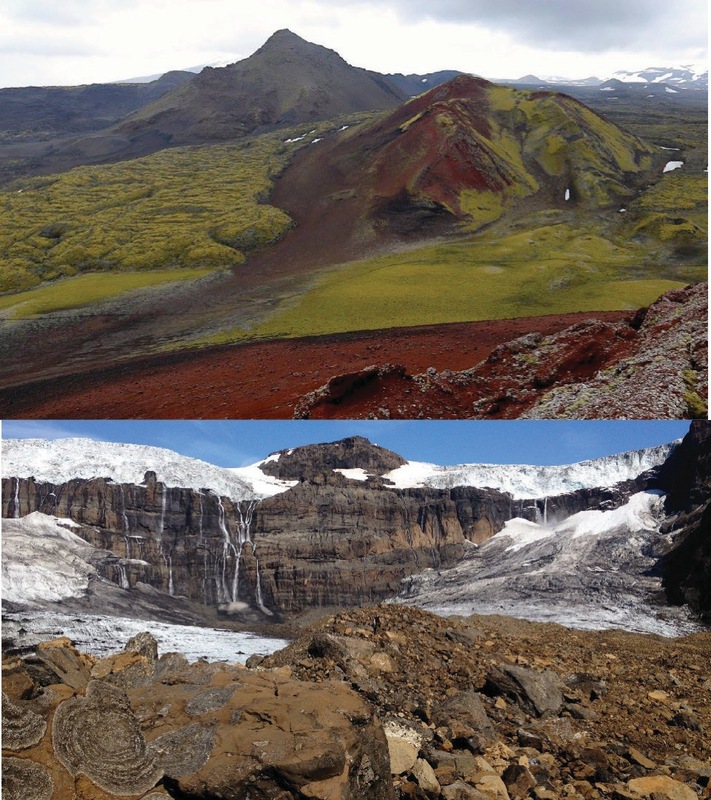 The integration of contributions from the Signal Processing Lab., the Institute of Earth Sciences, and Life and Environmental Sciences at the University of Iceland along with excellent partners and collaborators from international and domestic institutions provides a strong platform to develop and implement state-of the art mapping and monitoring techniques that are fine-tuned to Icelandic geology and terrestrial ecology. 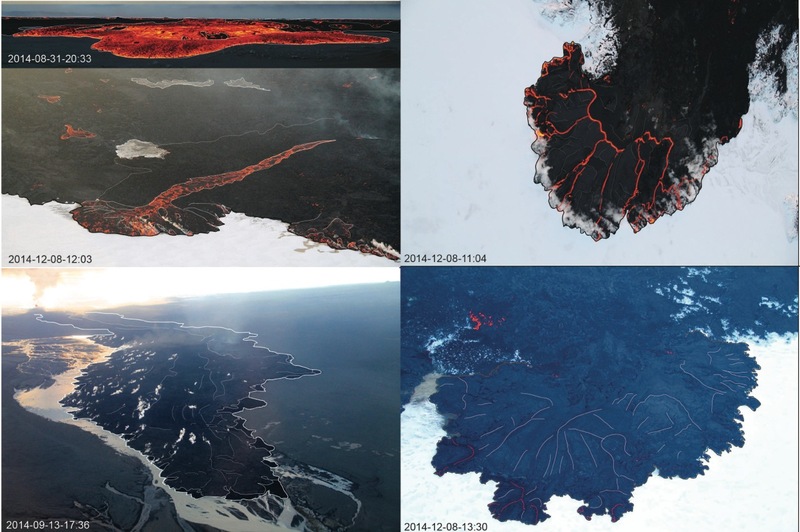 Five examples of different lava lobe emplacement observed at Holuhraun during the Bardabunga eruption. The different emplacement mechanisms produce different lava morphologies that can be linked to different lava advancement speed either through open or closed lava pathways. Grindavík area seen from the field and from airplane. Correlating obsertvations in the field and from remote sensing data is important to exploit the wealth of information that can be obtained from remote sensing data in a automated way. Correlation between field observations and RS data in order to find diagnostic characteristics of different volcanic landforms on RS data at different temporal and spatial resolution. Topographic map of the Elysium volcanic province and the Utopia Basin, which is one of three basins in the northern lowlands. 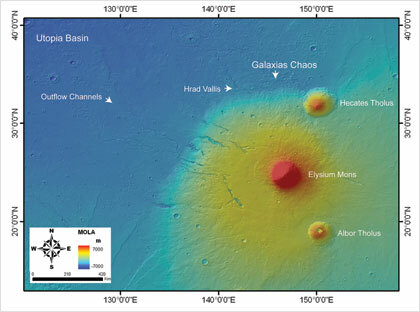 The Galaxias region is located on the north western flank of this transition zone and has been influenced by both volcanic activity, ice‐rich deposits and volcano‐ice interactions. Keywords: Volcanology, remote sensing, geomorphology, geomorphometry, GIS, geospatial analysis, object based image analysis, Mars, Iceland, planetary science.